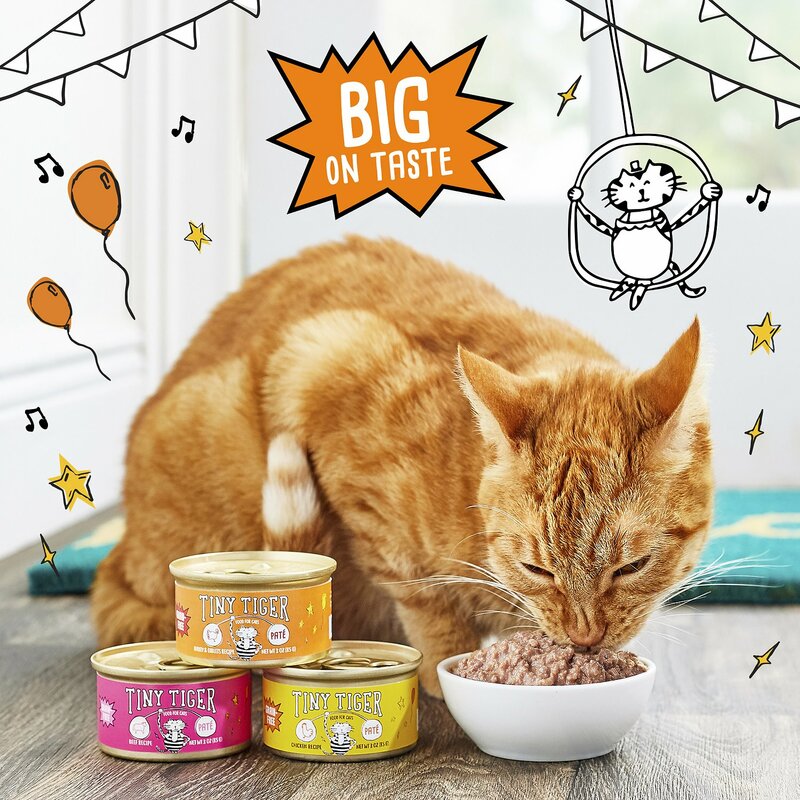 Feed your cat’s biggest dreams with a bowlful of delicious, grain-free nutrition. 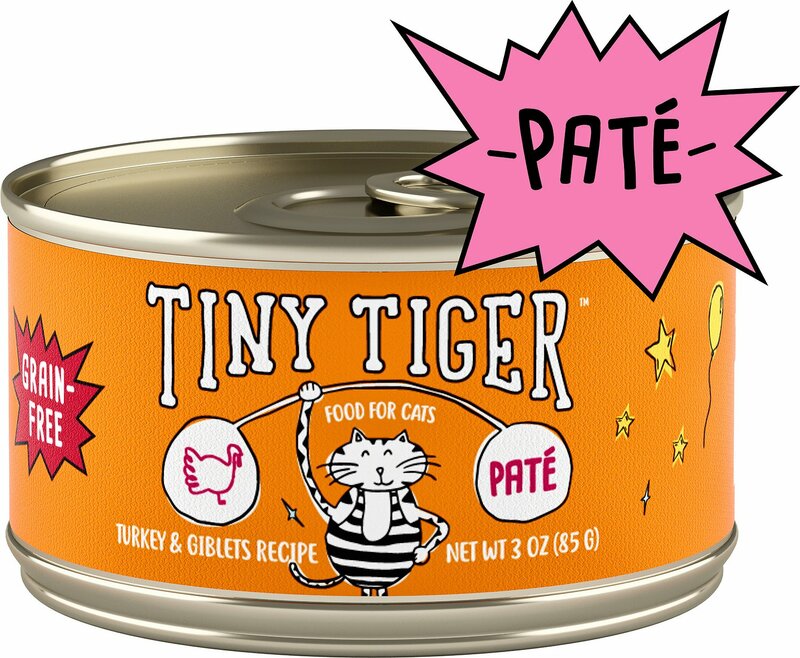 Tiny Tiger paté delivers the protein your mighty feline needs to perform at his best, with real turkey as the first ingredient. It’s a complete and balanced diet in every can, and a total showstopper when it comes to flavor and nutrition. Cats love the taste of real turkey and poultry giblets, and you can feel good knowing each bite packs the nutrients he needs to stay in tip-top shape, like vitamins, minerals and essential amino acids like taurine. Plus, there’s real broth to add healthy hydration, and never any grains like corn, wheat or soy. Open up a can and feed the stripes within! 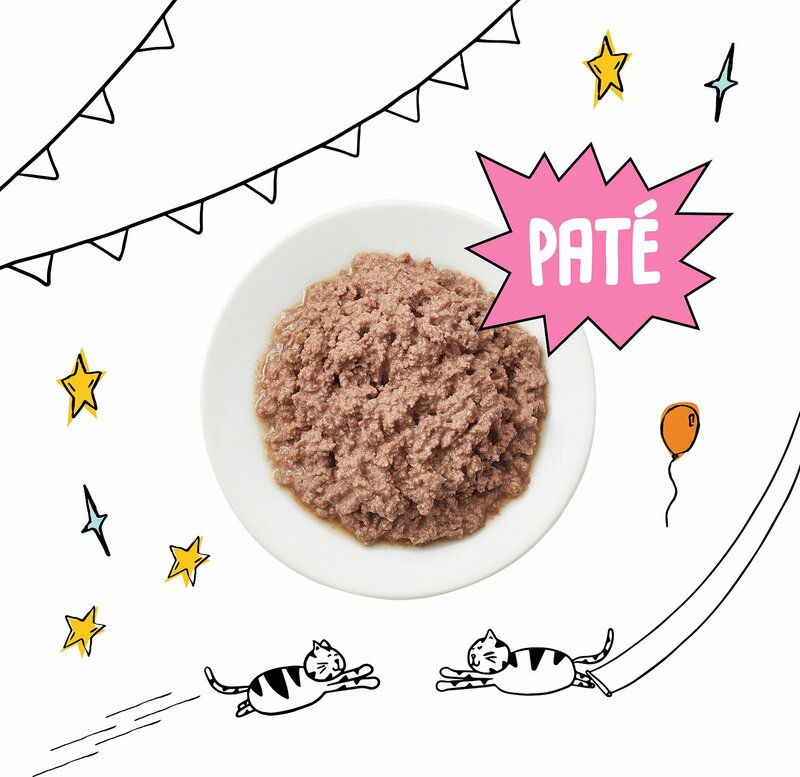 Grain-free paté features real turkey as the first ingredient for the protein and flavor cats crave. Real broth provides the necessary moisture levels to help add daily hydration to meals. Manufactured in the USA with ingredients from around the world, and never any grains, corn, wheat, soy or carrageenan. Turkey, Liver, Meat By-Products, Turkey Broth, Poultry Giblets, Natural Flavor, Guar Gum, Potassium Chloride, Choline Chloride, Vitamins (Vitamin E Supplement, Thiamine Mononitrate, Niacin Supplement, D-Calcium Pantothenate, Pyridoxine Hydrochloride, Riboflavin Supplement, Vitamin A Supplement, Biotin, Vitamin D3 Supplement, Vitamin B12 Supplement, Folic Acid), Minerals (Ferrous Sulfate, Zinc Oxide, Copper Proteinate, Sodium Selenite, Manganese Sulfate, Potassium Iodide), Taurine, Salt, Tricalcium Phosphate, Menhaden Fish Oil (Preserved With Mixed Tocopherols) Magnesium Sulfate. Adult: Feed 2 cans per 6-8lbs of body weight per day. 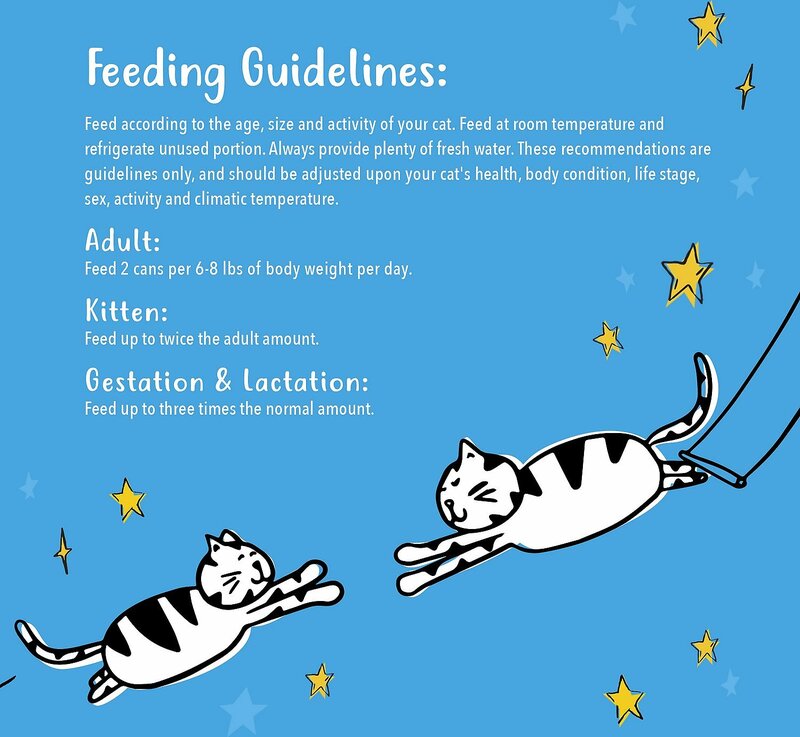 *Feed According to the age, size and activity of your cat. Feed at room temperature and refrigerate unused portion. Your cat should always have access to clean, fresh water. Is the food all life stages? Yes, this food is for cats of all life stages. All Tiny Tiger pate formulas are made in the USA. Has Tiny Tiger ever had a recall? No, Tiny Tiger has never had a recall. The cans have pull tabs for easy opening. Where is Tiny Tiger made? Tiny Tiger pate formulas are produced in Kansas right here in the USA! Does this item contain gravy? No, this pate does not include gravy. 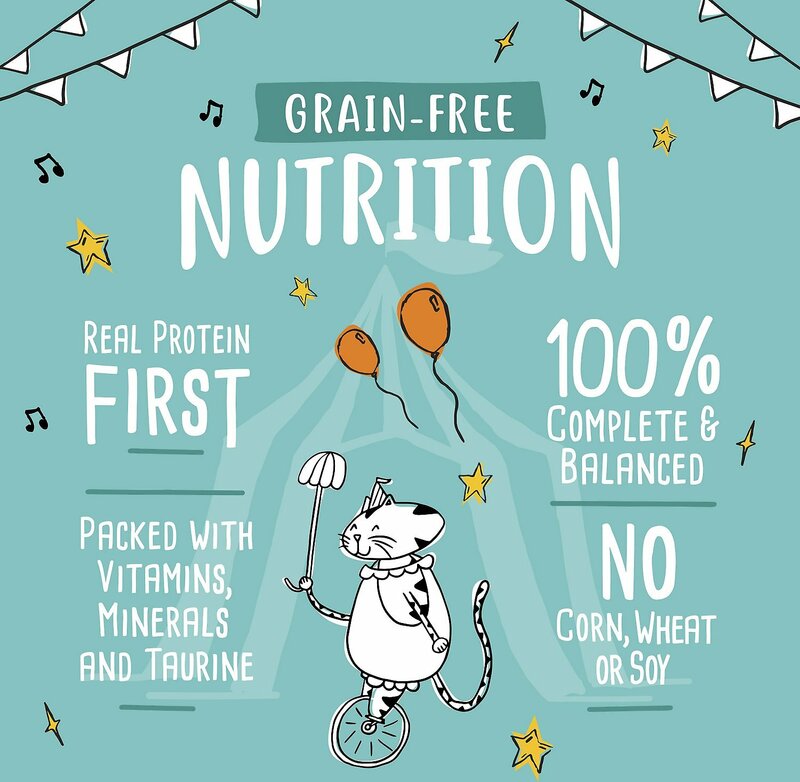 Great Product but NOT FOR A FUSSY EATER! We recently switch to this from Sheba after a short trial where our cat Sheamiss seemed to prefer this. Shaemiss has allergies so it took a little while to find something that wouldn't cause a reaction but this flavor seems to be working fine so far. Decided to try this b/c of chewy's discount, and the ingredients list seemed to be decent. My cat enjoys variety, so I mix up what I give her, and she's been chowing down this week. Will try the other flavors. Both cats like this food very much and because its low carb (less than 2%) it works great for my diabetic cat. My cat also has some skin issues so I am hoping this will help as it has no seafood or grains but does have vitamin E so may help with allergies. 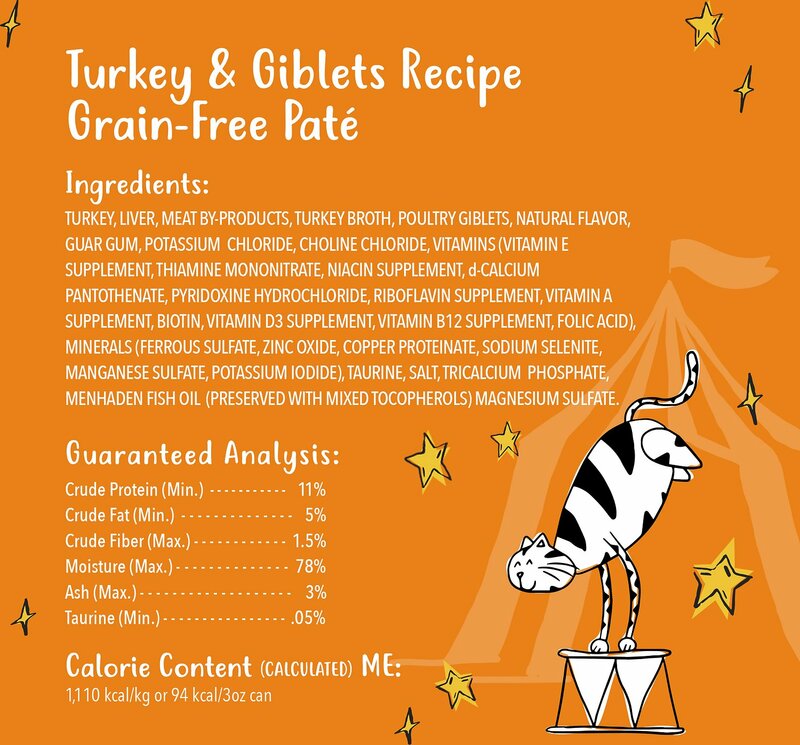 I have been using another brand of Turkey and Giblet pate but noticed they do include fish and the carb count is higher. This is the first grain free moist food my cats like to eat. I have some fussy eaters and spending a lot of food they won't eat is not helpful. I gave Tiny Tiger a try and they love it. Customer Service is always the best at Chewy as well. Tiny Tiger Turkey and Giblets Pate is a hit! Cat loves it. He cleans the plate and asks for more. I like the texture of this food--not too mushy and not too dry. I will order this again and it will be interesting to see if it is consistent from one batch to the next. I have found that most canned cat foods are not consistent--even the expensive ones. I'm pretty sure my cat would give this 5 stars if he could. I rotate canned foods regularly and at the moment this seems to be his favorite. He devours it every time. I knocked a star off because I'm not super thrilled with a few ingredients, but I like the price and the best cat food is the one your cat will eat so this one's a winner for now. It's a pretty dense pate, but I just mix in a little water and he loves it. I will continue to buy as long as my cat will eat it. I don't worry about lack of water drinking. The food is very moist. My fussy girl had no problem eating this food on the first day. My other fussy girl needed a topper, but easily transitioned to no topper. I like the ingredients and, apparently, my girls do too. Though it is pate, it is not smooth and reminds me of the Hills Science s/d my 3rd girl needs by script. If I weren't worried she'd make a bladder stone by looking at the food, I'd change her over to Tiny Tiger. This is a winner in our house, especially based on my 2 fussy girls' palate.